Community supported agriculture is a subscription model of food distribution. 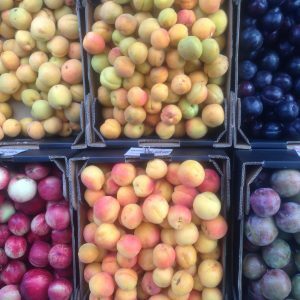 Sign up before the season starts and receive regular deliveries of organic seasonal fruit, direct from Tellurian Fruit Gardens. CSA is based on risk sharing and a direct relationship between farmer and eater. It provides a tangible link between you and the source of your food, therefore allowing you to participate actively in sustainability. Sales close 25 Nov or when sold out (approx 50 shares available). We have given our suggested price, but are providing the opportunity those who genuinely can not afford this, to pay less. For those who can afford it, every dollar spent above the suggested price can be used to assist someone in financial hardship. 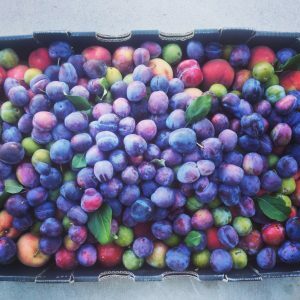 By valuing your share of fruit at the highest price appropriate to your situation, you can contribute to the ‘solidarity economy’ of our farm community. Collectively we can assist those in financial hardship and fairly reward farmers for growing safe and nutritious food. If you can not afford our lowest price, or can not afford the lump sum payment, please get in touch. We can work out a payment plan or a moneyless exchange. 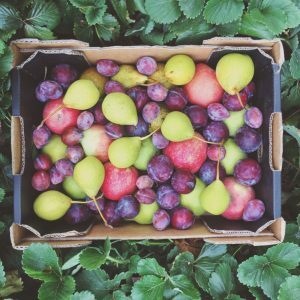 A box of mixed organic fruit (of your chosen size) will be delivered to you directly from Tellurian Fruit Gardens once a week. Deliveries will be for 18 weeks from 01 December 18 until 30 March 19. Bendigo, Castlemaine and Daylesford will be delivered on a Wednesday. Kyneton, Coburg, Carlton, Thornbury, Preston and Nth Melbourne will receive deliveries on a Saturday. You can find your Hub Host locations here. Or you can collect your share from the farm. By purchasing a share you are becoming a CSA member (hooray! ), and therefore are agreeing to our ‘members’ agreement‘. For more info click the share of your choice below. See the basics of how it works. Learn more about the benefits to you and the community. Check the Australian Food Sovereignty Alliance website.